Chanukah is just around the corner, which means we are all searching for the perfect gift for loved ones. You want to give something that the recipient will like, but won’t become clutter. I like to give personal gifts that match the person’s interests and needs, but sometimes that can also be difficult (and costly). I have found that having a list of “go-to” gifts is very helpful. I sometimes stock up on these items if I see them on sale, just to have them on hand in case. ∞ Candles — I like soy candles best because they don’t use harmful chemicals. ∞ Decorative notebooks or journals — In the fall you can get lots of cute notebooks and folders in the school supplies section. Otherwise book stores and stationery stores are great places to find neat journals. ∞ Personalized notecards — Visit sites like Ink Garden or Vista Print. ∞ Picfolio Mini or Picfolio Minutes albums — Visit Creative Memories. If you want to order anything, let me know! ∞ Books — Check to see if your recipient has an Amazon wish list and get them something they have posted. ∞ Cookbook holders — We have been through several of these. 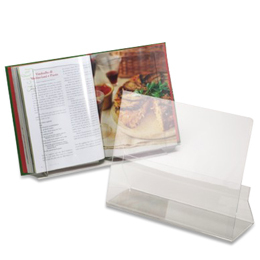 They are great to hold up your cookbook and keep it clean. The Container Store currently carries them. ∞ Gift cards to a local kosher restaurant or Amazon. ∞ Magazine subscriptions — Check out Discount Mags, Magazines.com or Amazon. ∞ Fisher-Price toys — Great toys for infants, toddlers and preschoolers. 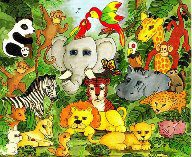 ∞ Magazines like “Wild Animal Baby,” “My Big Backyard” or “Ranger Rick” from the National Wildlife Fund. ∞ Viewmasters and reels — A great Shabbos toy. ∞ Puzzles — We have gotten some great original and handcrafted puzzles from Heirloom Puzzles.